Whether run at Colonial Downs or Laurel, repeat Virginia-bred stakes winners are common, which is why year after year, past stakes winners come back to compete. On Saturday afternoon as part of Laurel Park’s “Class on the Grass,” defending stakes winners found it difficult to find their way back to the winner’s circle. 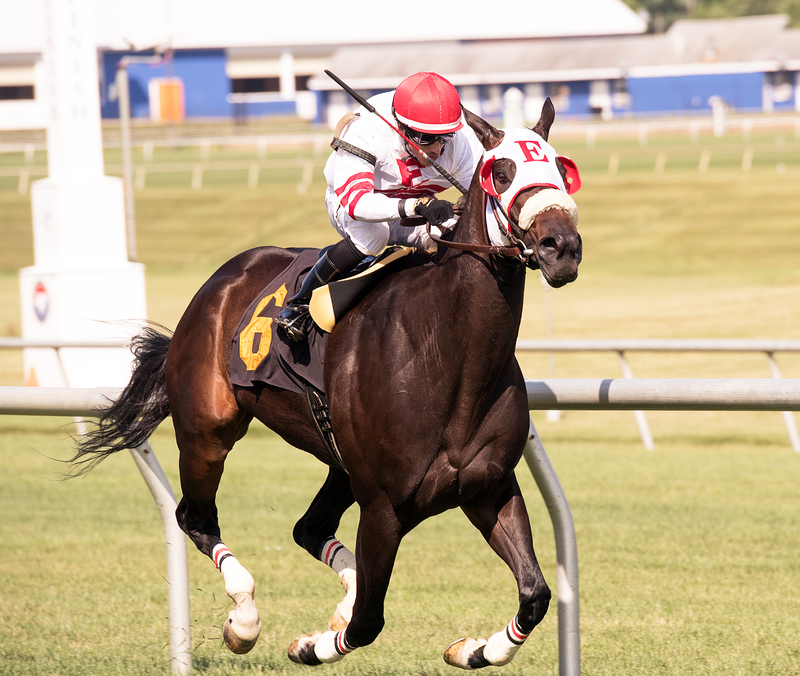 Tiz Our Time won the biggest race of her career Saturday by capturing the $75,000 White Oak Farm Stakes, part of the Maryland-Virginia Breeders’ Day festivities at Laurel Park. Tiz Our Time won the second annual White Oak Farm Stakes June 24th at Laurel. photo courtesy of Jim McCue. Special Envoy (#4 outside) edged Rose Brier (#3 inside) in a thriller Saturday in the $75,000 Edward Evans Stakes at Laurel Park. 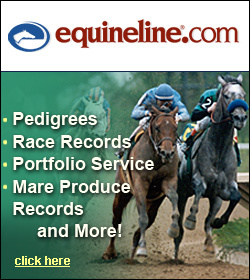 This was the first of four turf stakes on the program for Virginia-bred or sired horses. 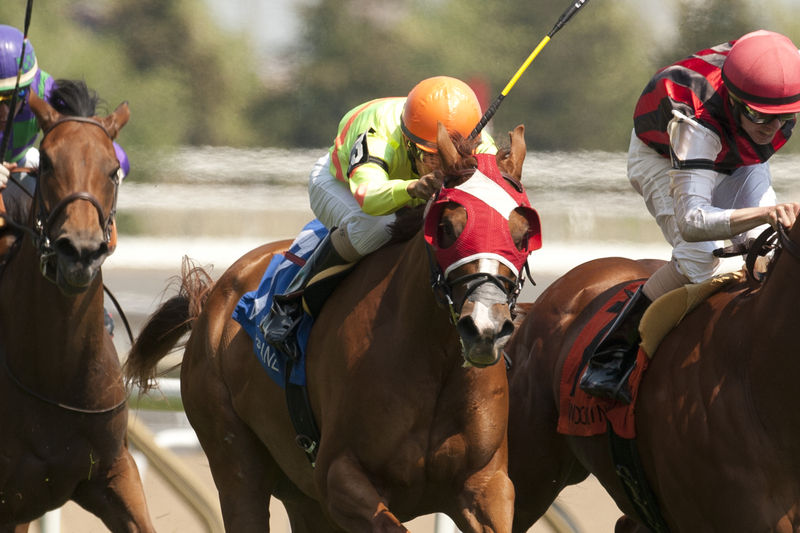 Special Envoy (outside) battles with Rose Brier (inside) in the $75,000 Edward Evans Stakes. photo by Jim McCue. Most of the Virginia-bred focus Saturday will be at Laurel Park, where a four pack of $75,000 stakes will be contested, but two Virginia-bred horses are competing in a pair of elite races elsewhere on Saturday. 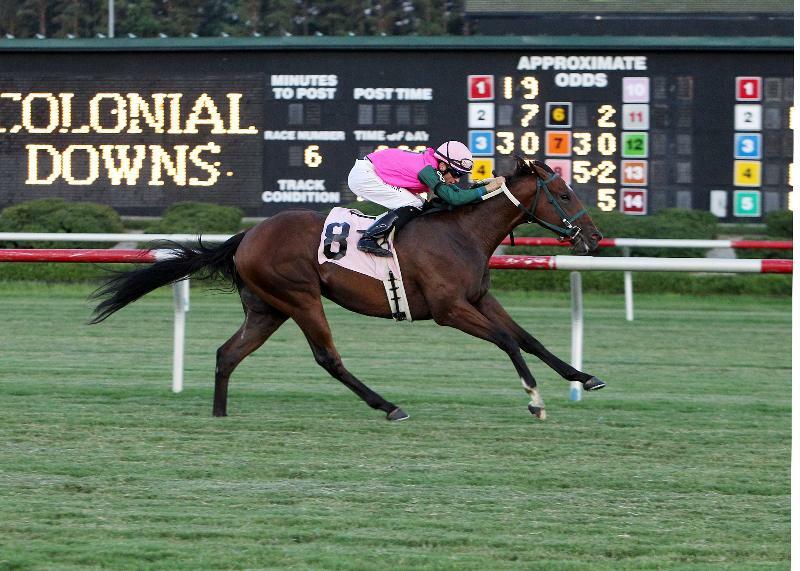 Long On Value won the Jamestown Stakes at Colonial Downs in 2013. Courtesy of Coady Photography. This piece appeared on The Racing Biz website and was written by Frank Vespe. Listen to The Racing Biz radio Saturday mornings on Richmond’s ESPN 950-AM from 10-11 AM..
A pair of graded stakes winners, multi-millionaire Ben’s Cat and hard-hitting middle-distance star Rose Brier, headline Saturday’s day of six restricted stakes at Laurel Park. 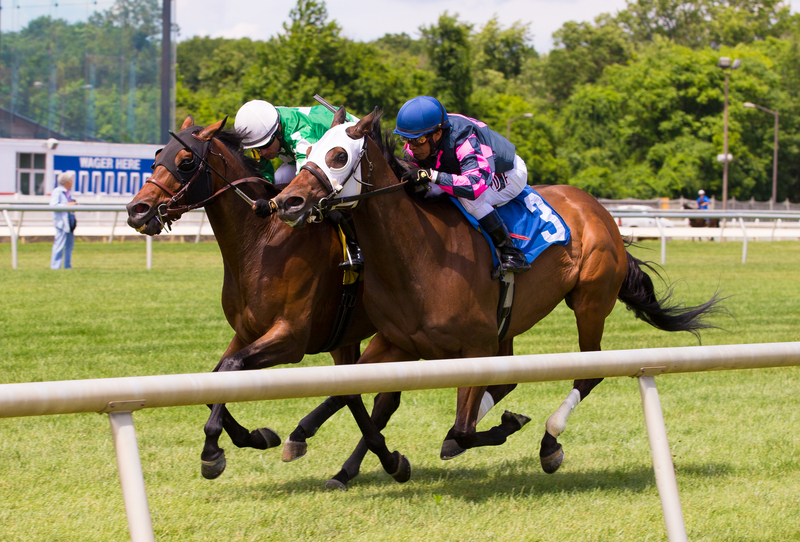 Virginia Breeders’ Day will feature a four pack of $75,000 Virginia-bred turf stakes — the second editions of the Edward Evans, Nellie Mae Cox and White Oak Farm Stakes, and the inaugural Tyson Gilpin Stakes. A pair of 5 1/2 furlong maiden turf sprints for Virginia-breds will also be carded — one for colts and another for fillies/mares. The following piece appeared in The Paulick Report June 14th. Lazy Lane Farm’s Hansel, winner of the Preakness and Belmont Stakes, and subsequently an Eclipse Award winner as champion 3-year-old male of 1991, was euthanized Tuesday at his owner’s farm in Upperville, Va., due to the infirmities of old age. He had been pensioned from stud duties in 2012. TORONTO, June 11—Queen Del Valle, invading from south of the border, took over from front-running Will She in late stretch and prevailed by a half-length length in Sunday’s $100,000 Alywow Stakes at Woodbine. The final time for the Alywow, a six-furlong turf race for 3-year-old fillies, was a track-record 1:12.93 on a firm course. A Virginia-owned filly captured a stakes north of the border and five Virginia-breds got to the winners circle on a successful Belmont Stakes weekend for horses/connections with Commonwealth ties. Six different tracks were represented courtesy of those successes. Happy Belmont Day! Hope everyone has a great afternoon enjoying 6 Grade I stakes including the big race at 6:37 PM. There are several Virginia bred and raised horses to cheer on today at Belmont. 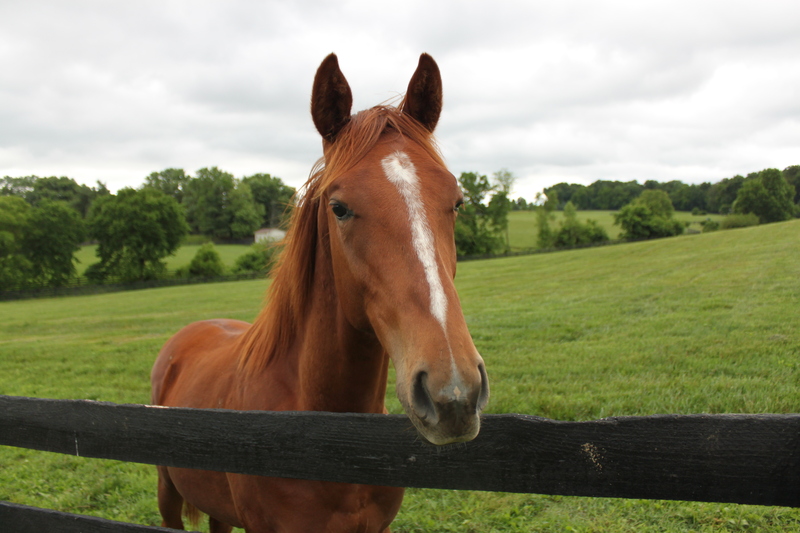 Sadler’s Joy, shown here as a yearling at Woodslane Farm in The Plains, finished third in the Grade I Man O’ War Stakes May 13th as a 4 year old. Photo by Nick Hahn.